Again, I had only one taker for this strenuous double day climb. I threw this once into the local chapter schedule, expecting full well that few would sign up for the 800 mile drive, plus the 8,000, or so, feet gain, all at high altitude. I was actually scheduled to lead Mt. Shasta this weekend, but I had no one for that. Instead, I received a call from Boris, and we bargained for peaks to do. Since I had scheduled University and Independence Peaks on a previous weekend with, again, no callers, I opted to uphold my "honor." Leaving work early Friday, we stopped in Bridgeport, then for a brief hike at Obsidian Dome on the way south along U.S. 395. I was intent on enjoying the best of the Eastern Sierra this weekend. The drive alone is beautiful. Saturday morning, we started, after breakfast, up the trail to Robinson Lake. There was a huge avalanche here, at Onion Valley, in the winter this year. It wiped out the USFS ranger station, and knocked down quite a bit of trees. A big stream crossing is necessary to follow the trail. Although there is a use trail that doesn't cross the creek, at first, it may be followed upward. However, this runs into brush, and you still have to cross the creek. Crossing the creek at its start is preferable. This can be dangerous in high water, and I have turned back more than once because of this! Robinson Lake was frozen or partially thawed. Never cross water on snow or ice if conditions are in doubt! We hiked up firm snow toward University Pass. We had ice axes, which were plenty handy. The sun was very bright today. Apply sunblock frequently during such a snow climb. Dark glasses are also a must. If you forget to bring these, it would be better not to do any more snow viewing, since the consequences could be severe. You can lose your vision from going snowblind, and the sunburn will keep you awake for many nights. We climbed up to the lowest saddle to the right. I grew tired from kicking steps, so Boris took over and charged to the Pass. "Wow," could only weakly comment on the view! A sandy use trail leads right, and into class 2, large boulders to the top. What an easy climb! I was wearing a polypro shirt and shorts. A bandanna under my cap made for sun protection to my ears and neck. I regret I didn't move about for the summit view photos. A rock to the northwest hides a better view down Bubbs Creek. I forgot to take a photo as I went over there, for some reason. We signed in the register book, and had plenty of time to relax. 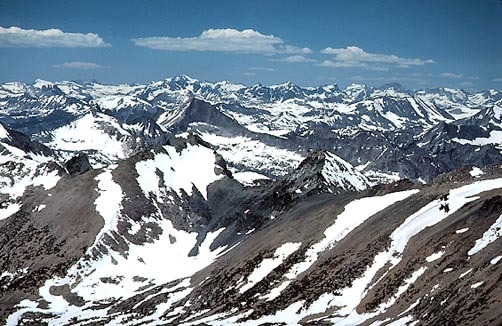 University Peak is named, originally, after the University of California at Berkeley, when it was the only such campus in the State (1880's). It is an SPS Mountaineer's Peak, meaning, roughly, it "counts" more toward a Emblem goal. Presently, I need two more Mountaineers Peaks for my Master Emblem. Only some 65 climbers have achieved this climbing goal. We clambered back down the huge granite talus, and I stepped carefully, at first, down the snow couloir from the Pass. I feared a wet snow avalanche, since the snow was very mushy, or a bad slip. Boris just ran down, so I followed. We wondered about also doing Independence Peak, which would be another 1,400 feet gain. It would put us back to the cars late, and we would miss a restaurant dinner. I came back anyway, in 1996, to solo this easier, "give-away" peak. We returned to my car, and I chose to drive to Lone Pine for dinner. Sometimes, I am game for some night action. There are enough bars, used by the locals for pool games, music, and drink. The next day, we drove back up toward Onion Valley and set out to climb Kearsarge Peak. A side, dirt road, a mile or so down from the end of the road, leads to an unsigned trail. This now climbs up to within a thousand feet of the summit. Class 2, cross-country hiking, brought us to pass three false summits. Then, we reached the top. Three hang gilders were wafting high above, with apparently excellent conditions. The thermals of the Owens Valley are world-famous. Serious pilots will use bottled oxygen, as heights of 22,000 feet can be reached. I once thought to take up this sport. However, it has a high mortality rate. Turbulence can flip a wing, and send one plunging to the ground. Again, we had time to savor our success. There is a view straight down to the Onion Valley parking lot. Kearsarge Peak is another "giveaway" type summit. 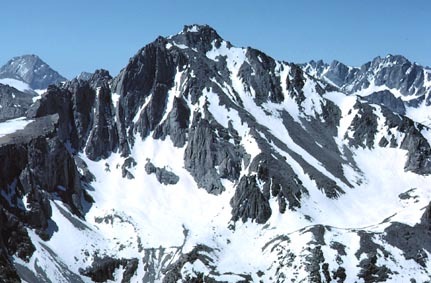 Many 11,000 to 12,000 foot peaks around Onion Valley are on the SPS list. I felt, at one time, that it was an excessive amount. This is a popular trailhead when coming from Southern California. With clear roads, it is only a four or five hour drive from downtown Los Angeles. On our return to my car, Boris found he misplaced his $300 wristwatch. We lost precious time looking for it. Leaving here at about 3:30 p.m., it would take to midnight for getting home. You need to be especially mentally organized, for these trips. Usually, these lapses only incur inconvenience. But in a survival situation, it can mean serious problems. He finally found his watch, after some suspicion. We had our long drive north on U.S. 395, then through Stateline on U.S. 50, and finished the trip. If you ever need suggestions on eating places and other conveniences, please contact me. I usually make an annual, early season drive down this scenic highway, checking on what's new. Just a bit of information can contribute to saving time, gas, and money. You might be surprised on what I keep notes on!